The Addicted to Holos box for August has arrived and I'm excited to share these pretty polishes with you! The descriptions were provided to me, and I've added my own comments beneath those. Enjoy! 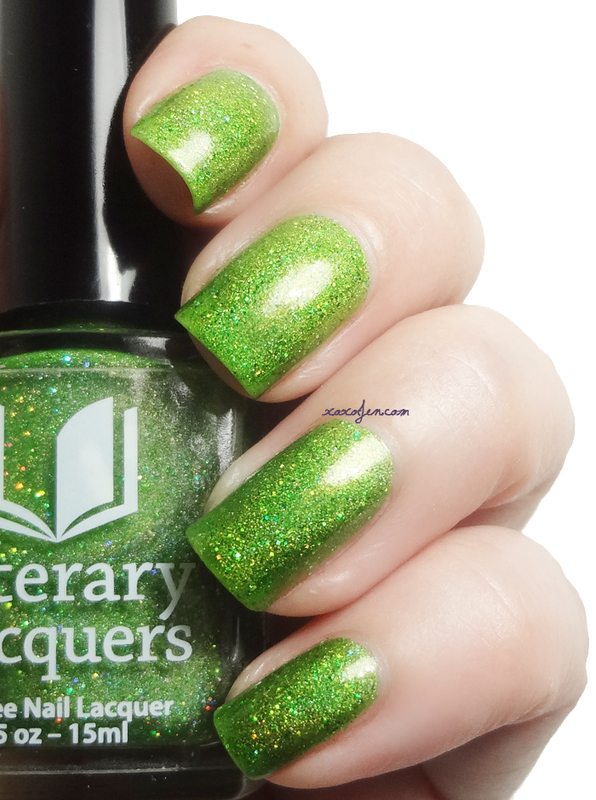 True green linear holo with gold and green micro glitter. 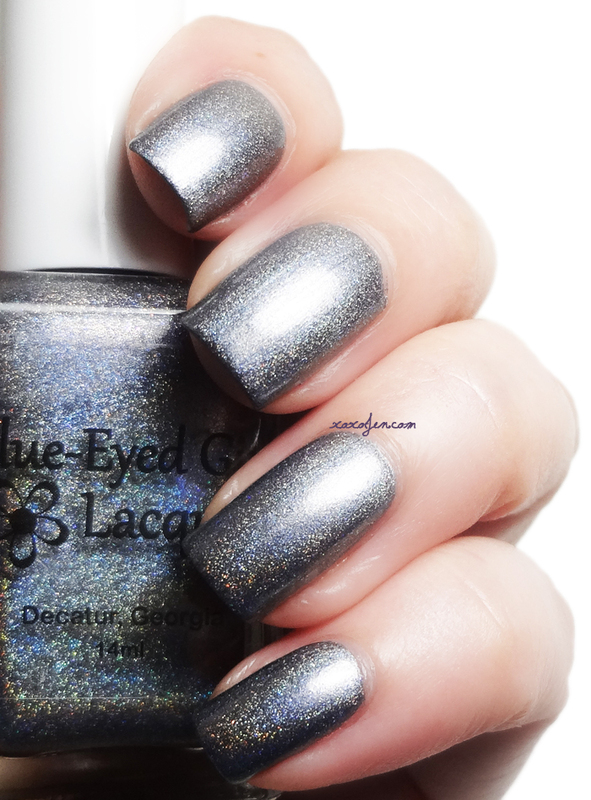 Lovely shade, buttery formula, opaque in two coats and just look at that sparkle! Cassandra is our host this month for the box and I think she created a fantastic polish! I enjoy seeing what PLL will think of next! Her color / shimmer / glitter combinations are unnique and this one is beautiful - but the formula of PLLs are always a challenge for me to use. It is thicker than most indies I've tried and seems to dry really quickly so I end up with thicker coats. The polish is a great concept, and looks lovely in spite of its challenging application. I feel like I'm cheating on purple with this polish - it had me at hello holo. I am falling deep in love with aqua and turquoise shades of everything! So. Much. Love. Perfect formula, opaque in two coats. Steel grey linear holo with pink and royal blue glass flecks. Totally looks like stainless steel but much more sparkly! Opaque in one coat and a little on the thick side but still easy to work with. I really like bright lime shades, they go perfect with purple or aqua and this one delivers! It's bright and sparkly and a pleasure to apply and wear. 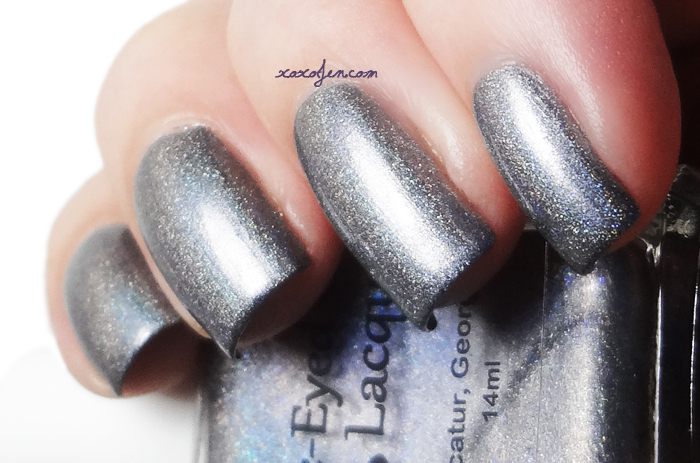 Opaque in two coats and super blingy in sunlight! Cate, in case you're reading this, you need this polish! The boxes will be available for preorder at the shop from 8/10/2015 through 8/17/2015. All polishes in the box will be limited edition and only available for the month they are offered. Gorgeous swatches!!! I'm still totally jealous of your ability to capture polishes so beautifully on camera!